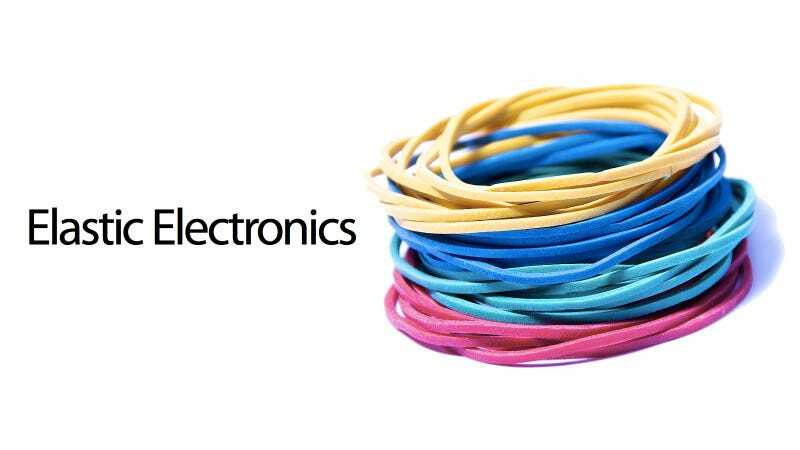 Elastic electronics are something engineers have been lusting over for a long ol' time. It's not hard to understand why: current constraints mean that most circuits are solid or, at best, slightly flexible. Imagine the possibilities if your conductors could stretch to many times their length. The problem is, though, that when most conducting materials are stretched, their material properties change—in fact, their conductivity typically drops by factors of tens or hundreds. That makes them practically useless. Now, a team from the McCormick School of Engineering has changed that by loading a polymer with liquid metal. They took the porous polymer material called poly(dimethylsiloxane), that can stretch to many times its original size. Then they placed a liquid metal called EGaIn inside the pores, in turn allowing electricity to flow consistently even when the material is excessively stretched. The new material, which is discussed in an article in Nature Communications, can stretch to twice its length without any drop in conductivity. That makes it four times more extendable than any other elastic conductor ever made.